NOTE: This was previously named the Casey Cowl. Rows of thick garter stitch make a long and comfy cowl that can be wrapped around the neck for close warmth, or worn long and tucked under a coat. Pattern is written for three yarn weights. 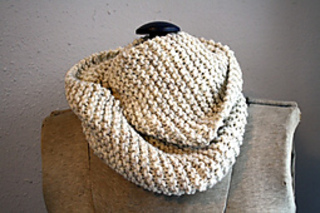 This cowl can be made with worsted, chunky OR bulky weight yarn.